Tight musical harmonies, magical sets, and one of Stephen Sondheim’s most accessible works come to life in San Antonio’s historic Woodlawn Theatre — and they all add up to a don’t-miss local theater performance. The story pours the traditional fairy tales of Cinderella, Rapunzel, Little Red Rising Hood and Jack in the Beanstalk into a witches cauldron, and stirs them up with a hearty shaking of social commentary and adult humor that looks at the dark side of happily ever after. All the actors’ performances are solid, but Megan DeYoung’s turn as the Wicked Witch was truly spectacular, and had the audience laughing during her cleverly subversive rap of the “Witches Entrance,” while sighing at the emotional punch of “Stay with Me,” and “Children Will Listen.” Trevor Chauvin hits the perfect note as Jack, and his “Giants in the Sky,” was a definite high point. The Woodlawn Theatre itself is rich in history — John Wayne himself hosted the premiere of “The Alamo” there in 1960, and this gem of San Antonio’s Deco District is being lovingly restored bit by bit to its former glory. If you haven’t been down yet to see a show, make the trip for this one. 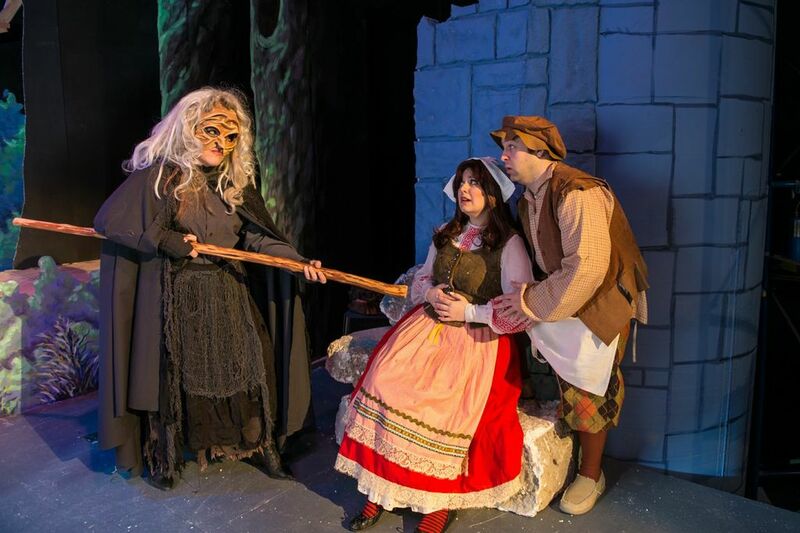 Into the Woods runs this through March 16. Tickets are on sale now at www.woodlawntheatre.org or by calling the box office at 210-267-8388. Show times are Friday and Saturday at 7:30 pm and Sundays 3 pm. Tickets cost $15 – $23 with discounts for students, military and SATCO members. Go on a Saturday night, and hang out in the lobby lounge afterwards for “Broadway Nights,” featuring local singers taking their turn in the spotlight. Feel brave enough, and you can bring your own sheet music and sign up for a turn at the mic. Do you have any comments specifically about Act II? I brought my young kiddos to see Act I, which ends with an illusion of “happily ever after,” and they thoroughly enjoyed the show. I think you made a good call for your kids. We had a mom with a little boy sitting in front of us when we went, and she whisked him out about 2 minutes into the second half. Not to give away the play, but the whole message of the second half is that choices have consequences. And in this play, they are brutal. Half the cast dies in the second act, courtesy of a giant who comes climbign back down the beanstalk. It’s fantastic dark humor but probably upsetting for younger kids. I see that the Woodlawn recommends it for 13 and up.